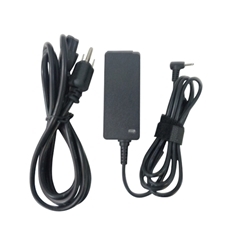 Description: New 40 watt high quality aftermarket 3 prong laptop ac adapter and power cord. Output: 12V - 3.33A. Compatible Part #'s: A12-040N1A, AD-4012NHF, BA44-00286A. Samsung Chromebook XE303C12, XE303C12-A01US XE303C12-H01US, XE500C12. Samsung Smart PC 500T (XE500T1C), Smart PC Pro 700T (XE700T1C).